Could that big, green, forested hill become a park? We caught wind of this story via Curbed and also checked out Gothamist’s take on it—both sourced their info from those urban exploring cats at LTV Squad, who really know their stuff. It’s all very interesting. 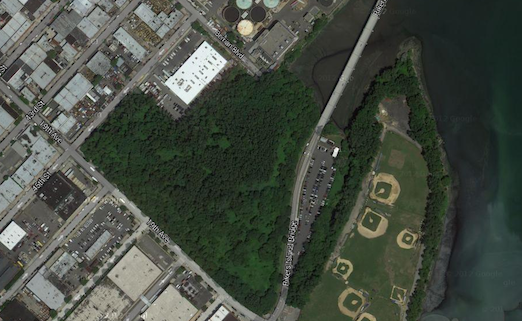 Basically, there is a big forested hill on the northeast corner of Astoria, near Hazen Street, AKA the road to Rikers. It’s all fenced off from the public. Some Astoria natives call it The Mountain and say it’s made from the dirt excavated during the construction of LaGuardia airport. Others, who called it The Dumps, believe it was a landfill at one point. Unfortunately, it seems the Port Authority wants to level at least 20-30 feet off the top of the mountain and create a ‘staging area’ for runway extension work that will be performed at LaGuardia airport. In the process, I’m sure the vast majority of the trees on this property would be cut down. Meanwhile, the DEP report suggests the land could be used for an enlarged sewage treatment plant (they have an existing one down the block – why not build it there like they did in Greenpoint?). Thus you have two government entities vying for the use of public owned property without any community input. A potential scenario could be the Port Authority clearing the trees and grading the top of the mountain for their temporary use in the runway expansion project, while turning the property back over to the city afterwards for the construction of an enlarged sewage treatment plant afterwards. What do you think—should it be a park, open green space, or should these other entities do something with it. We’d love to know your thoughts!